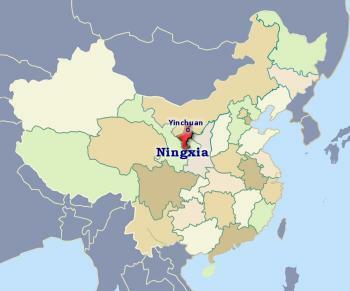 Ningxia is more formally known as the ‘Ningxia Hui Autonomous Region’, and so is not strictly a province of China; the designation reflects the high proportion (34%) of Hui people that make it ethnically diverse. It was created in 1928 to govern a larger area (including parts of Mongolia) only to disappear in 1954 before re-creation in 1958. It is situated on the bend of the Yellow River (Huang He) as it heads north towards Mongolia. Apart from the waters of the river it is a dry and dusty place with thick loess deposits. The Great Wall marks its northern boundary, its southern border follows the Qingshui river basin. It is a poor province, only moderately industrialized; although the recent discovery of oil; coal and gas fields has brought rapid development in places. Settled as early as the Xia dynasty, Ningxia flourished as the Yellow River offered reliable irrigation as here the river is not so prone to flooding as it is further downstream. The Xintongxia Dam 青铜峡 and Qintong Gorge (1968) hydro-electric dams on the Yellow River have helped to control river flow and generate electricity. 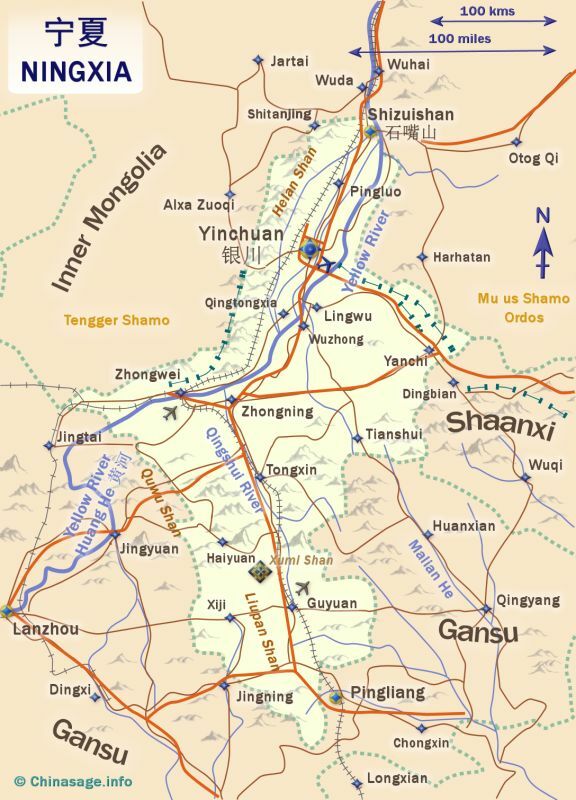 Yinchuan (银川 Yín chuān) or ‘Phoenix City’ was once the capital of the Xixia (Western Xia) kingdom in the 11th century that governed most of north-western China for a while. The city is split into the modern part (Xincheng) and the old part (Laocheng) to the east. There is a provincial museum with a large collection of finds from the Western Xia culture. It has large Drum Tower and Yuhuang Ge of Ming dynasty date. There are many interesting sites to visit in the rest of Ningxia including the Western Xia Tombs ➚ which are mini pyramids at Helan Shan; Baisikou Twin Tower ➚; Haibao Tower; Chengtian Xita; Nanguan mosque ➚ and colorful markets. The Hui (Muslim) people are descended from traders along the Silk Route who settled here and then by Central Asian immigrants during the Yuan dynasty. Portions of the rammed earth portion of the Great Wall can be seen at several locations along this vital defensive segment of the wall along the arterial Silk Road. Complex irrigation schemes created as early as the Han dynasty have allowed agriculture to flourish in the river valleys. To the south of Yinchuan lies Qingtongxia Zhen ➚ with 108 dagobas of Western Xia or Yuan dynasty date. The southern portion of Ningxia province is generally poorer with a high proportion of Muslims. Liupin mountain ➚ is a scenic area. Xumi shan ➚ has a great many carved figures. Tongxin has one of the largest mosques ➚ in the province, and is built in the Chinese style. To the west near Zhongwei, Shapotou ➚ is set on the fringes of the Tengger Desert and here the sand can be heard to ‘sing’ in the wind. Ningxia is famous for growing Wolfberries ➚ or ‘goji’ berries that have been touted as a health or super food ➚ in Europe and America. It is one of the ingredients of a local specialty eight treasure tea 八宝茶 babaocha. Licorice root ➚ is also grown in this area. Ningxia belongs to the dry northern region of China. 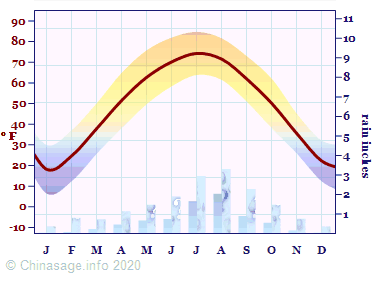 It has cold winters and short but hot summers with little rainfall. Citation information for this page : Chinasage, 'Ningxia Autonomous Region, China', last updated 29 Nov 2018, Web, http://www.chinasage.info/maps/ningxia.htm.